Genesis 1:26–27 (ESV) — 26 Then God said, “Let us make man in our image, after our likeness. And let them have dominion over the fish of the sea and over the birds of the heavens and over the livestock and over all the earth and over every creeping thing that creeps on the earth.” 27 So God created man in his own image, in the image of God he created him; male and female he created them. One summer day (I think I was about sixteen), I found myself at home alone. Flipping through the television schedule I saw that the USA network was showing The Planet of the Apes. Having never seen the movie, and knowing nothing about the story, I was curious. I sat down and watched what was to become one of my favorite films. 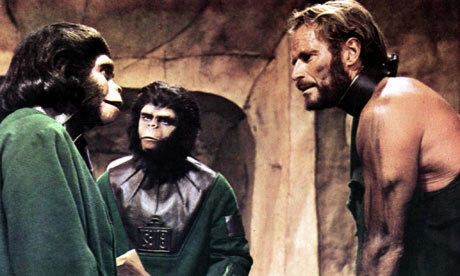 The original Planet of the Apes used the setting of the monkey planet to comment on race issues in the United States during the 1960’s. Having no preconceived notions, the film’s ending floored me. I was hooked. Over the years I watched the other Apes movies and enjoyed the story’s progression. Donna and I even sorta, kinda liked the Tim Burton remake with Mark Walberg. Who knew? So, we were excited when the new movie, Rise of the Planet of the Apes, became a late summer box office success. Since Tessa was so young this summer, we didn’t see the movie in theaters, but watched and read favorable reviews. This past Monday night, after borrowing the blu-ray, we watched the new prequel. Well, at least the last 1/3 disappointed. For the first two-thirds of the movie, the filmmakers had us. James Franco’s character, a young scientist searching for a cure to his father’s Alzheimer’s, made us sympathize with his moral dilemma. We understood why he took the actions he did. We felt sorry for Caesar, the brilliant monkey who didn’t have a place in the world. I suspect PETA (kidding, but only a bit). Due to many circumstances, the once sympathetic Caesar became the leader of group of super smart chimps, gorillas, and orangutans. This point is where the movie lost me. Here’s the problem. Caesar and his group began to fight back against the humans who mistreated them; but it didn’t stop there. By the end of the movie the monkeys were attacking humans and fighting against anyone standing upright. The monkeys were vicious and Caesar was brutal. The movie makers wanted us to root for the monkeys. Not what the writers and directors were going for. This failure brings us back to the two above passages from Genesis. They tell us two things. First, humans are God’s only creation made in His image. We are different from anything else He has made. Second, we have been given dominion over animals. We are in charge. Animals are not made in God’s image. Christ did not die for animals. Animals are less important than people. When people reject the basic truth that God created man in his image and place a too high priority on animals or nature . . . , well I’ll just let Paul tell you. Romans 1:22–32 (ESV) — 22 Claiming to be wise, they became fools, 23 and exchanged the glory of the immortal God for images resembling mortal man and birds and animals and creeping things. 24 Therefore God gave them up in the lusts of their hearts to impurity, to the dishonoring of their bodies among themselves, 25 because they exchanged the truth about God for a lie and worshiped and served the creature rather than the Creator, who is blessed forever! Amen. 26 For this reason God gave them up to dishonorable passions. For their women exchanged natural relations for those that are contrary to nature; 27 and the men likewise gave up natural relations with women and were consumed with passion for one another, men committing shameless acts with men and receiving in themselves the due penalty for their error. 28 And since they did not see fit to acknowledge God, God gave them up to a debased mind to do what ought not to be done. 29 They were filled with all manner of unrighteousness, evil, covetousness, malice. They are full of envy, murder, strife, deceit, maliciousness. They are gossips, 30 slanderers, haters of God, insolent, haughty, boastful, inventors of evil, disobedient to parents, 31 foolish, faithless, heartless, ruthless. 32 Though they know God’s righteous decree that those who practice such things deserve to die, they not only do them but give approval to those who practice them. These “wise” filmmakers turned out to be fools. It’s elementary, my dear apostle. Sherlock Holmes. It all started with Sherlock Holmes. My name is John and I am an anglophile. Don’t worry, that’s not a disease or addiction, it just means that I like things that are British: Holmes and Watson, Shakespeare, BBC sitcoms on public television, things like that. I married an anglophile. I hope Donna is okay with me outing her. Since we do enjoy a bit of Brit, we find ourselves pushing the kids to enjoy it as well. This year we all sat down to watch A Christmas Carol with none other than Jean-Luc Picard himself, Patrick Stewart. He’s British. A Christmas Carol is one of the great stories of the English language. We all know Ebenezer Scrooge and how he turns from a curmudgeon to one who lives out the spirit of Christmas each day. While Patrick Stewart did an excellent job showing the change in Scrooge’s life after his ghostly encounters, Christmas is about more than being nice and charitable. This weekend, everyone had the opportunity to attend church on Christmas day. We gathered at 10 AM for worship at FBC and the Lord blessed our service. Christmas is about God in the flesh, Jesus Christ, the second person of the Trinity, coming into the world to purchase sinners out of slavery to sin, resulting in adoption into the family of God. Sherlock Holmes would surely appreciate Paul’s words. 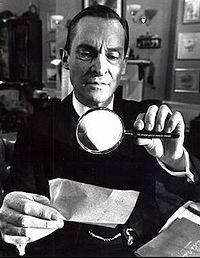 After all, Paul was talking about the “elementary principles.” Holmes used the word elementary to show Watson and others that his seemingly astounding insight was actually simple deduction. Like Holmes’ conclusions, the gospel is elementary. Without Christ we find ourselves under the elementary principles of the world. Through repentance and faith, we find ourselves under the lordship of Jesus Christ. I don’t know what your weekend was like, but mine was filled with family, food, presents, and laughter. Most importantly, it was filled with worship. Do you know, that you know, that you know, that you know? Do you struggle with the assurance of your salvation? As a pastor I have discussed this issue with many church members. How can a person be sure that they will not lose their salvation? What happens when we sin and do not “feel” saved? What if we die with unconfessed sin in our lives? In a sermon from Romans 5:18-19, David Martyn Lloyd-Jones, preaching in the 1960’s, spoke of the parallel between the first Adam, who sinned in the garden and caused all people to be made sinners, and the second Adam, Jesus Christ, whose obedience to die on the cross brought life for all those in Christ. Can you think of a safer place to be?